Who created the content on the page? Look to see if they are qualified to write about the topic. Do they have advanced degrees? Are they experts about the topic? Is contact information listed for the author's/ owners of the site? an e-mail contact is not enough. Look for an address and phone number as well. Scan the web page for links that say About, Abut Us, Background, Biography, etc. 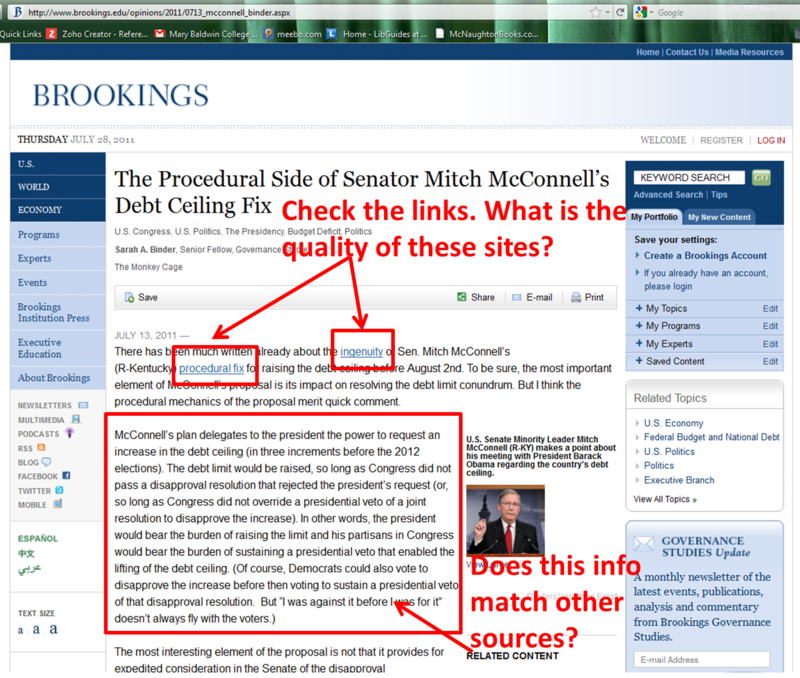 If you do not see these types of links, go to the web site’s homepage. You can do this by cutting back the URL to each “/” and pressing enter. Look for the name or organization responsible for the page. Try doing a search for their name in Google. If the page seems to be the work of a hobbyist, or if you can’t find the author’s credentials, think carefully before using the page as a source. .org= advocacy. The .org extension signifies an organization. The primary purpose of this page is to influence public opinion. Beware of biases and opinions. .com= business, entertainment, news. The primary purposes of these pages are to promote or sell products and services, provide entertainment or news. *.gov= informational. These are government websites. Provide factual information such as government data or research reports. ~= personal. Personal pages are diverse and may be devoted to a hobby or favorite activity. The URL may have a variety of endings, but they usually include a “tilde” ~ followed by a name. Example: [http://www.marybaldwin.edu/~janesmith]. These pages may not be maintained as strictly as institutional pages. Be sure to check their date. 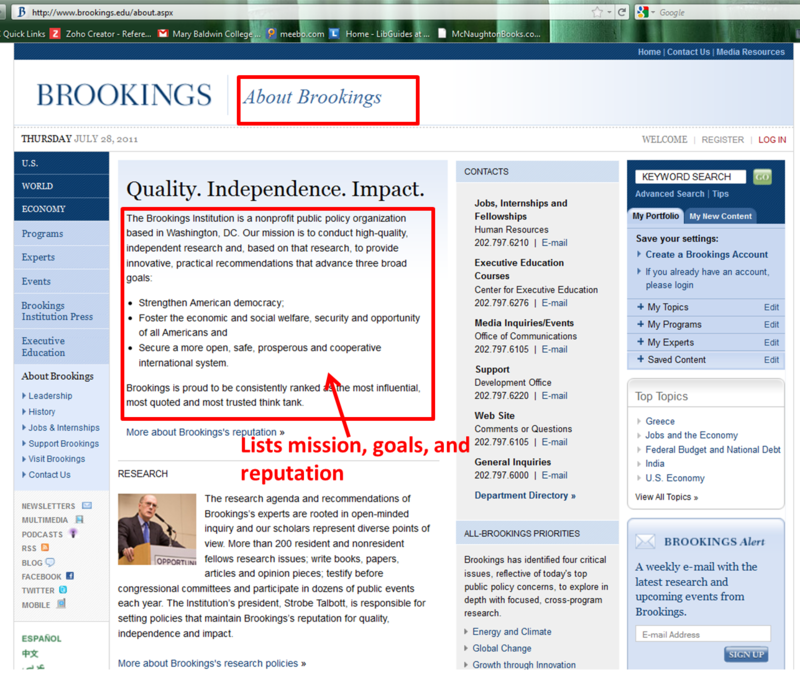 *- preferred URLs, because they're purpose is more consistantly informational and unbiased. Is there a bias or opinion to the information presented? Don't discount a website because biases and opinions are present, but be aware that there might be important facts missing and you might not be getting the full-story. Make sure to watch out for subtle biases which might not be advertised. Is the purpose of the website clearly stated? Is the purpose to broadcast an opinion? 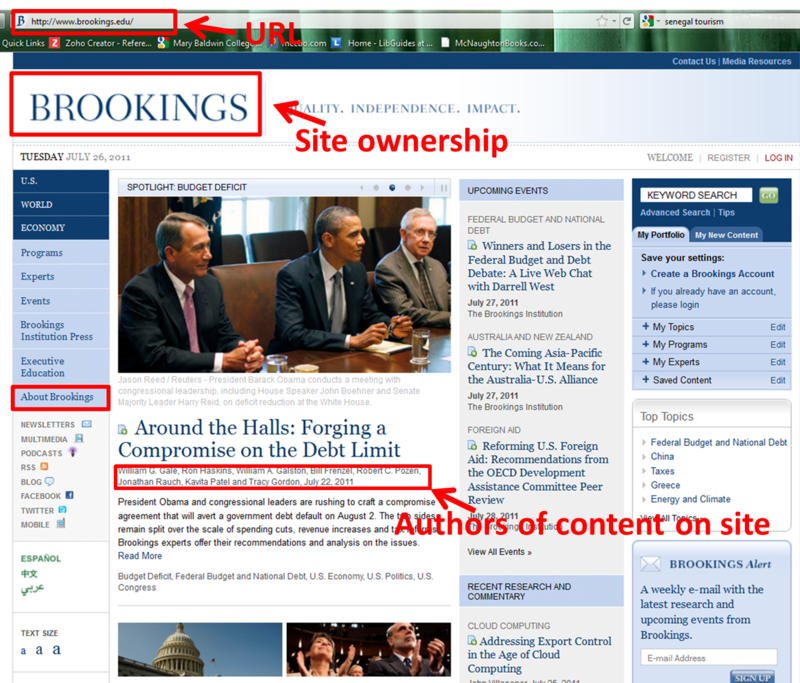 Advertising may indicate the content of the page is designed to sell you something. Is the information on the site familiar to you? Does it correspond with other information you've read? Are there references/ bibliographies listed? Are theses sources reliable? If there are no references provided, verify the information with other sources. Is the information based on research/documentation? If so, check the qualifications of the researchers. Are they affiliated with a research institution or university? Is the information reproduced from another publication? If so, does the site link to the original? If the reproduction is retyped, it could have been altered intentionally or unintentionally. If there is a list of links on the page, do they work? Do they link to reputable sources? Is the site free of grammatical and spelling errors? When was the website and its content last updated? The dates are usually at the bottom of a web page, along with any copyright information. 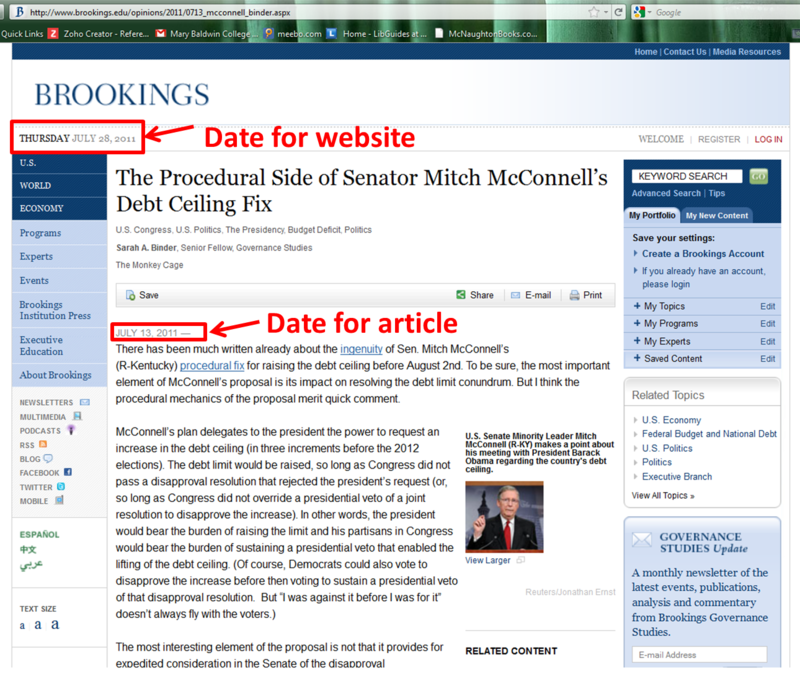 If you're using a website with content written by different people, there may be different dates. A date for the website as a whole, and a date when the individual article/post was written. DO NOT use statistics if there is no date associated with them. This a print-handout version of everything that will be discussed in this section on evaluating web sources.